The Age of Sigmar is upon us! Well, this looks like a fantasy version of a Space Marine… a “Sigmarine”, if you will. Well, let’s take a look at the new, free rules, shall we? Huh, only 4 pages. Dead simple stuff, like measure from the model. Wait, no bases? Bases don’t matter? That will make movement odd. And what’s this “piling in” on melee combat? No more Regimental deployments? And no points, just bring whatever you want? Are you kidding me with this? No. They are not kidding. This is the final travesty for me. Games Workshop has been fiddling with the rules and the army lists for years, changing parts of a game that I have enjoyed (mostly) since the early 90s. Twenty-plus years. I made tons of friends and had hours and hours of enjoyment from playing and making models. Every couple of years GW would put out a new edition of the game that, at first, actually did improve the game. They did the same thing with 40k, too. Third Edition 40k and 6th Edition WFB were my favorites. Many rules issues had been ironed out and lots of new miniatures were available. Then Life happened in 2003 and I boxed up all my “toys” for a while. My Gaming group kinda evaporated. I moved into a tiny apartment that had no room for the hobby. Then I got married and started a whirlwind tour of the US. But I kept all my minis. In 2011 Life had settled down enough that I got the chance to unbox all my toys and at least get started with the Hobby aspect of the game. Soon I found a new Gaming Community that was active and fun. I was able to participate regularly. And though the rules had been updated a couple of times in the intervening years, WFB and 40k were both still good games. Sure, some of the rules changes affected my collection of miniature soldiers, some had to be re-based, some had load-outs that were no longer legal in the rules. Irritating, but not Earth-shattering. For the past four years I have been able to enjoy my hobby, both painting and modeling my little soldiers and playing games with friends. Then came The End Times. The forces of Chaos have destroyed the Old World. An amazing storyline that surprised everyone, because the Good Guys are supposed to win! Nope. GW knew what they were doing and have known for years. They had to. They had novels written, huge sourcebooks prepared. Loads of new models and rules to support them. Now I know why they never bothered to find time to update the Wood Elves’ book in the past ten years. They’ve been getting ready to toss the whole heap in the trash. Barely months after the End Times saga concluded we get the Age of Sigmar. All of the Army books have been converted into “Warscrolls”. These aren’t just some cut-and-paste job, either. There are changes to many of the units. Some of the changes are silly, like “get a +1 if you have a better mustache than your opponent”. Actually, there are a lot of those. And the points values are gone, so goodbye any semblance of game balance. And, “A unit can have one or more models, but cannot include models that use different warscrolls“. So no more adding of Heroes to your basic troops to beef up their Leadership Bravery. It’s like GW codified every bit of the Win-at-all-costs Tournament Mindset that I personally didn’t like about the hobby. Gaaah, this could have been so much better. You know, I get it. GW didn’t just want a new edition of Warhammer Fantasy, they wanted a whole new game. And that’s fine. I just don’t want to play it. I liked WFB the way it was. So, the way I see it, I’m not leaving Games Workshop and Warhammer Fantasy Battle; GW and WFB left me. (So I get to keep the ring.) Will I still play 8th edition? Probably. I have all the stuff. Heck, I can play 5th edition if anybody wants to. So I am sad and a little angry (but not like this guy!) and I am done following GW on their journey. Mantic is in the process of releasing the Second Edition of their own Fantasy Battle game, Kings of War. I ordered the new rulebook earlier this week, and downloaded the free Core Rules for a friendly game with Danno. We didn’t discuss any sort of scenario or theme, just pick 2,000 points and play. It was different, it was fast-paced, and it was fun. One of the big selling points for many people is that fact that, because models are not removed from units to represent casualties, it means units can be modelled as single pieces, with action poses, scenery elements and dynamic dioramas. 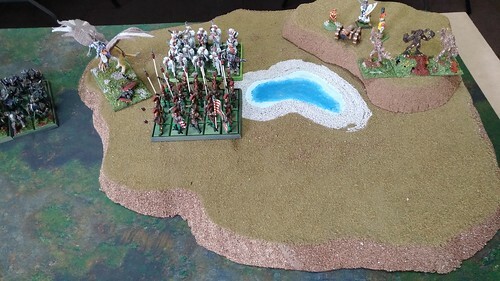 This can add a wonderful visual element to armies and players can really go to town and create great themed and detailed playing pieces. The game moves quickly because the player whose turn it is does all the dice-rolling. You move, you shoot, you fight melee. Boom. 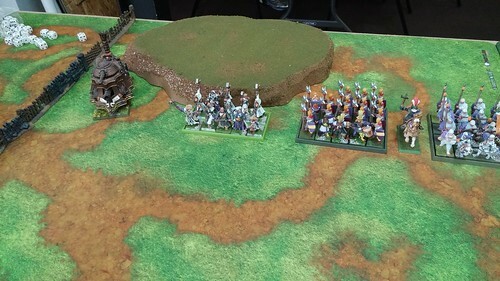 My General, Pikemen (can’t use in WFB anymore, BTW), Arquebusiers, “Ogres” (old GW Dryads) and cannon. 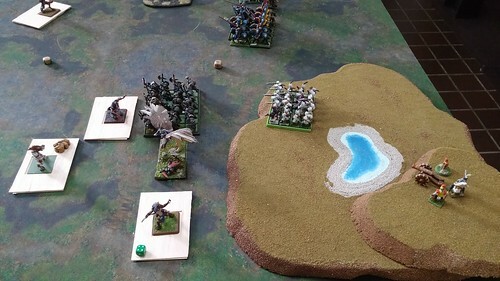 You can see here, at the end of Dan’s turn one, his units of Werewolves had wiped out my units of Ogres and Pikemen. The Werewolves are tough (285 pts for the unit of 6). But the Dwarves (at the top of the pic) survived their encounter. 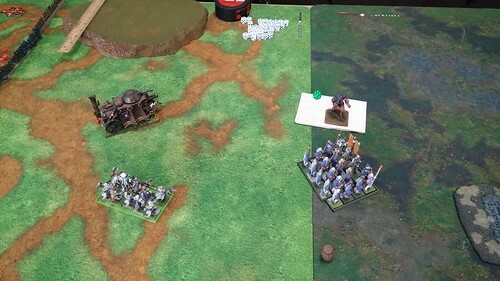 Next, these buggers took out the Dwarves and the cannon, but my Knights were on the way! The Werewolves went after the Arquebusiers next, who took an astonishing 24 points of damage, but rolled snake-eyes for Insane Courage. Pinned between the Arquebusiers and the Knights, the Werewolves got massacred. 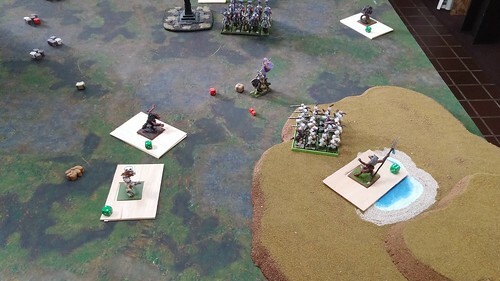 At the end of the game Dan’s units were out of position to capture any Objectives (like the barrel at the bottom of the pic). It was a Pillage! game so the Objectives counted more than thrashing enemy units. 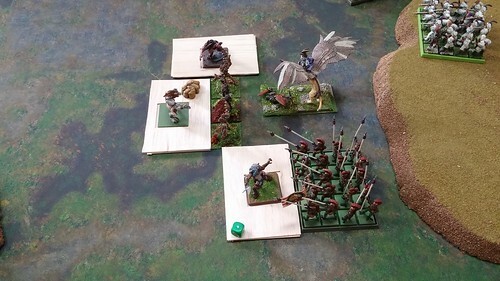 I had lost many more units to Dan’s overzealous melee, but I had two of the Objectives. 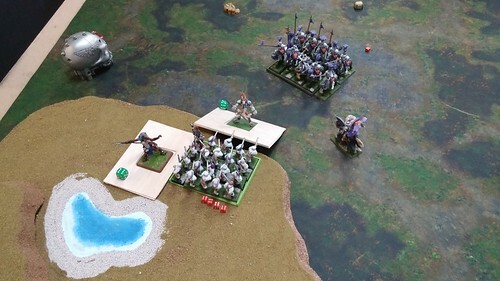 This is almost exactly the kind of game that I wouldn’t want to play in WFB or Age of Sigmar, because units as powerful as those Werewolves would have run the table. 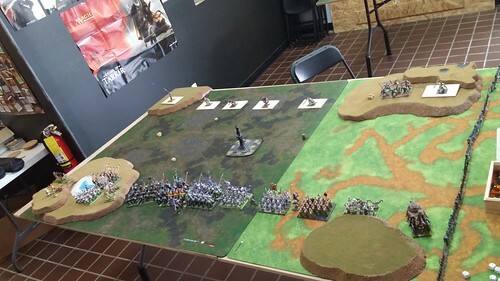 But WFB doesn’t allow for that type of army list and the mechanics of KoW allowed me to remain competitive and, in fact, win. You can watch a demo of how the game (First Edition, at least) plays on YouTube, here, from the Beasts of War. THIS WEB SITE IS COMPLETELY UNOFFICIAL AND IN NO WAY ENDORSED BY GAMES WORKSHOP LIMITED. Adeptus Astartes, Battlefleet Gothic, Black Flame, Black Library, the Black Library logo, BL Publishing, Blood Angels, Bloodquest, Blood Bowl, the Blood Bowl logo, The Blood Bowl Spike Device, Cadian, Catachan, the Chaos device, Cityfight, the Chaos logo, Citadel, Citadel Device, City of the Damned, Codex, Daemonhunters, Dark Angels, Dark Eldar, Dark Future, the Double-Headed/Imperial Eagle device, 'Eavy Metal, Eldar, Eldar symbol devices, Epic, Eye of Terror, Fanatic, the Fanatic logo, the Fanatic II logo, Fire Warrior, Forge World, Games Workshop, Games Workshop logo, Genestealer, Golden Demon, Gorkamorka, Great Unclean One, the Hammer of Sigmar logo, Horned Rat logo, Inferno, Inquisitor, the Inquisitor logo, the Inquisitor device, Inquisitor:Conspiracies, Keeper of Secrets, Khemri, Khorne, Kroot, Lord of Change, Marauder, Mordheim, the Mordheim logo, Necromunda, Necromunda stencil logo, Necromunda Plate logo, Necron, Nurgle, Ork, Ork skull devices, Sisters of Battle, Skaven, the Skaven symbol devices, Slaanesh, Space Hulk, Space Marine, Space Marine chapters, Space Marine chapter logos, Talisman, Tau, the Tau caste designations, Tomb Kings, Trio of Warriors, Twin Tailed Comet Logo, Tyranid, Tyrannid, Tzeentch, Ultramarines, Warhammer, Warhammer Historical, Warhammer Online, Warhammer 40k Device, Warhammer World logo, Warmaster, White Dwarf, the White Dwarf logo, and all associated marks, names, races, race insignia, characters, vehicles, locations, units, illustrations and images from the Blood Bowl game, the Warhammer world, the Talisaman world, and the Warhammer 40,000 universe are either ®, TM and/or © Copyright Games Workshop Ltd 2000-2015, variably registered in the UK and other countries around the world. Used without permission. No challenge to their status intended. All Rights Reserved to their respective owners.